Data logger from our latest V7 generation Data logger ALMEMO 710 offers outstanding functions - thanks to our latest D7 sensors. High-quality display - easy and convenient touchscreen operation The brightly illuminated, generously sized 5.7-inch colour graphics display shows all measured values and functions clearly and precisely. The device is operated easily and conveniently via touchscreen. The menu guidance system, incorporating wizards and help windows, has a clear, straightforward structure. Measured values, peak values, average values, and limit values can all be displayed in an easy-to-understand way in various forms, namely list, bar chart, or line graph (up to 4 lines). Users can even configure their own customised user menus to display those parameters required by a particular application. Choice of languages : German, English, French, Czech One measuring instrument for every use The measuring instrument is enclosed in a handy, compact housing with rubberised impact protection. This device can be used in a wide variety of ways, in mobile applications or as a desktop unit, on a folding stand or as a stationary unit in a wall-mounted housing. It incorporates a powerful rechargeable lithium battery to ensure a long operating time. 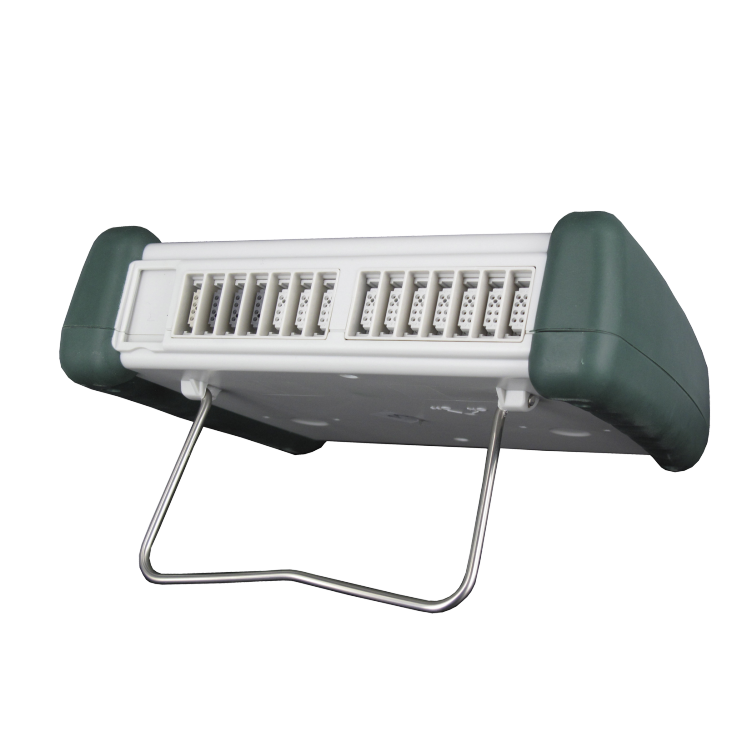 Data logger for all storage applications For the purpose of saving measured values the device incorporates an 8-MB fl ash memory. This can also be configured as a ring memory for monitoring tasks. To save larger data quantities an external memory is available in the form of a plug-in SD card. 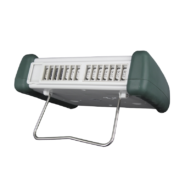 For autonomous long-term monitoring the data logger can also be run in energy-saving sleep mode. Measuring inputs for 10 ALMEMO sensors, all generations Data logger ALMEMO 710 incorporates 10 measuring inputs. All new and already existing sensors designed for any measurable variable can be connected and evaluated. Sensors using analog signals pass via the integrated high-speed, high-resolution A/D converter. Additional electrical isolation between measuring inputs and power supply (device ground) increases measuring quality. Digital D6 and the latest digital D7 sensors transfer measured values to the measuring instrument directly in digital form. 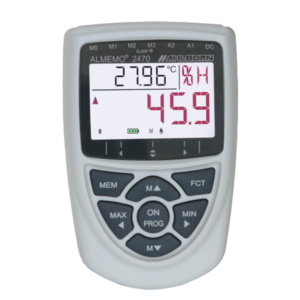 The measuring instrument supports all ALMEMO plug connectors and sensor functions. Digital D6 / D7 sensors can be configured directly via the touchscreen. 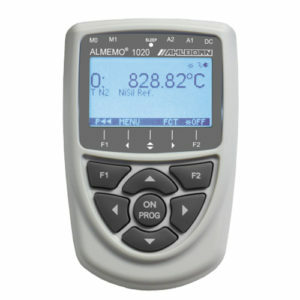 New digital ALMEMO D7 sensors With these digital ALMEMO D7 sensors the ALMEMO system is enhanced by many new functions. 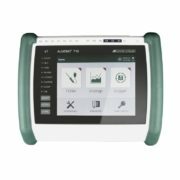 They operate via an all-digital interface to the ALMEMO 710 measuring instrument ensuring high-speed serial transmission of all measured values. The measuring ranges of ALMEMO D7 plugs are independent of the measuring instrument and can be expanded as and when required for new applications. Measured values can be displayed with up to 8 digits (depending on range) and the units with up to 6 characters. Sensor designation and information can be up to 20 characters. The ALMEMO D7 sensor has its own processor. These all work in parallel at their sensor-specific sampling rate. D7 sensors thus attain very high measuring speeds in dynamic measuring operations. 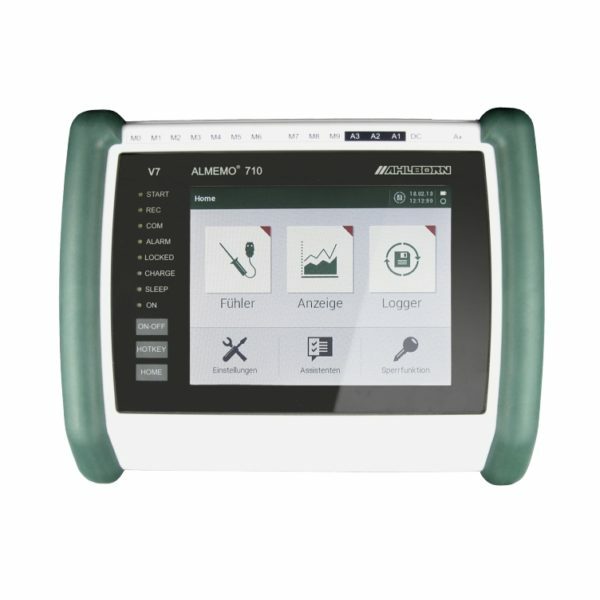 Scanning times on the ALMEMO 710 can be set individually for quick-acting and slow-acting sensors. 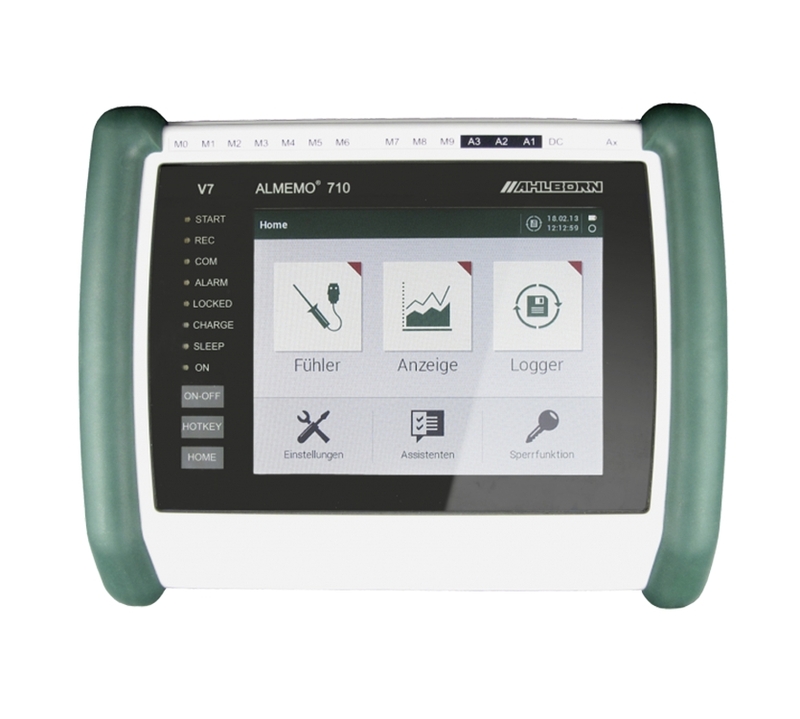 The ALMEMO D7 plug can process up to 10 channels for measured values and function values. This includes new applications, especially for multi-purpose sensors (e.g. Meteo sensors) and for linking up to complex third-party devices (e.g. chemical analysers, power analysers). 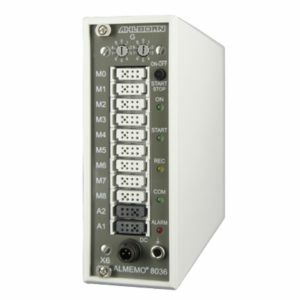 Other equipment With 3 ALMEMO output sockets it is possible to connect simultaneously a PC / network, an ALMEMO output interface with relays and analog output, and an SD memory card. The ALMEMO 710 incorporates an atmospheric pressure sensor to ensure automatic pressure compensation for measuring operations involving interalia air flow or humidity variables. With option KL it is possible - for an ALMEMO sensor (e.g. temperature or pressure sensors) - to program multi-point adjustment or linearization in the ALMEMO plug itself. This option is possible with all ALMEMO plug versions. Standard connector (analog or DIGI), ALMEMO D6 and D7 plugs..